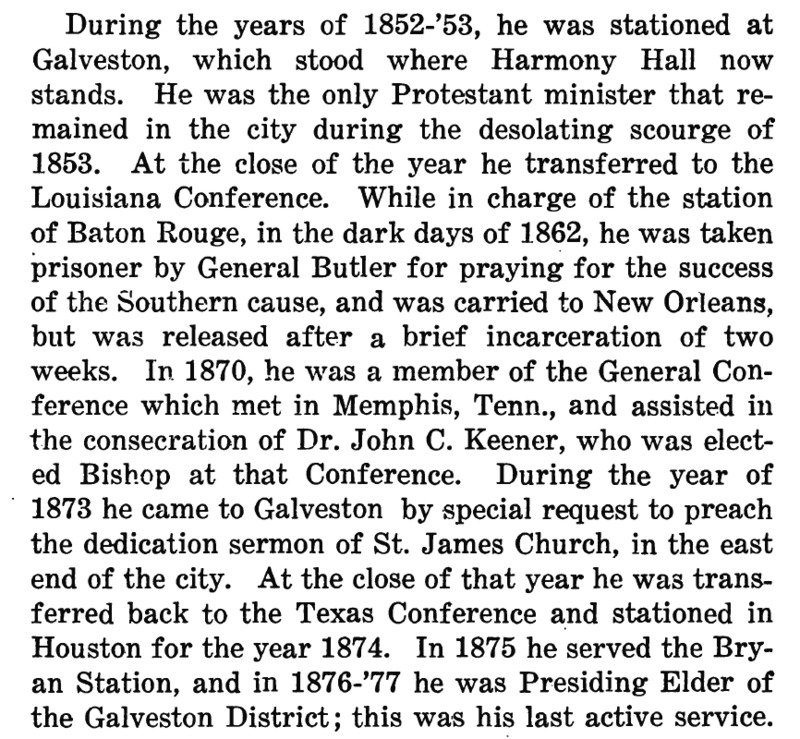 Shearn Church is a Methodist Church that was built in Houston, Texas in 1842. 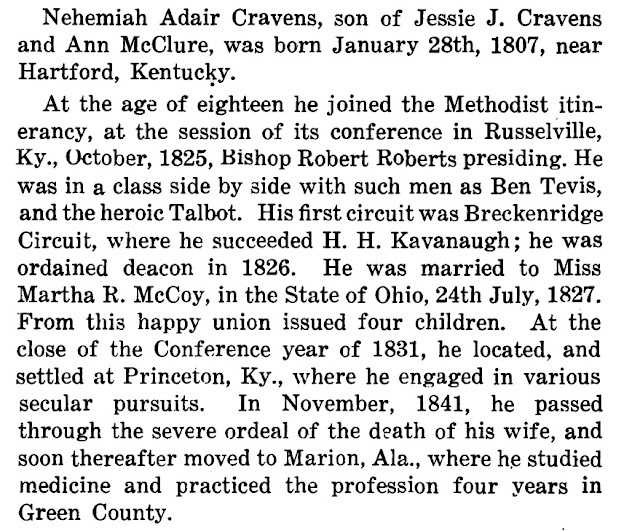 Mr. Nehemiah A. Cravens became the pastor of the Shearn Church in 1847. He was an old-fashioned Methodist preacher who believed in pastoral visiting, praying with families and instructing children. He was a good singer. 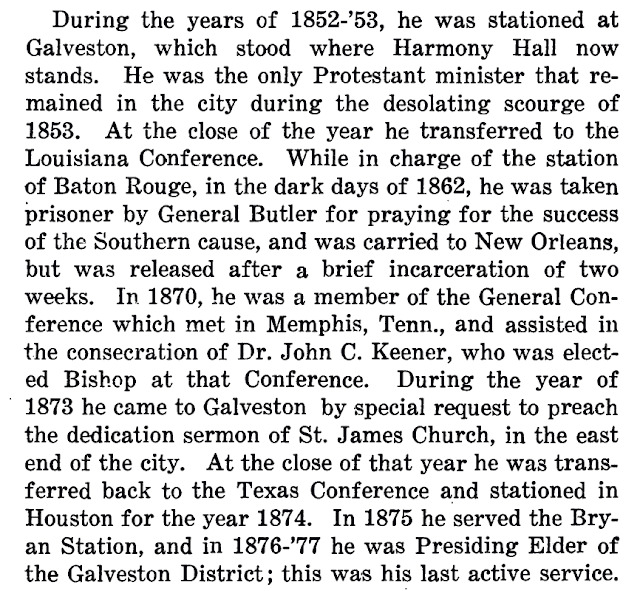 In 1875 he was transferred to another Texas church. 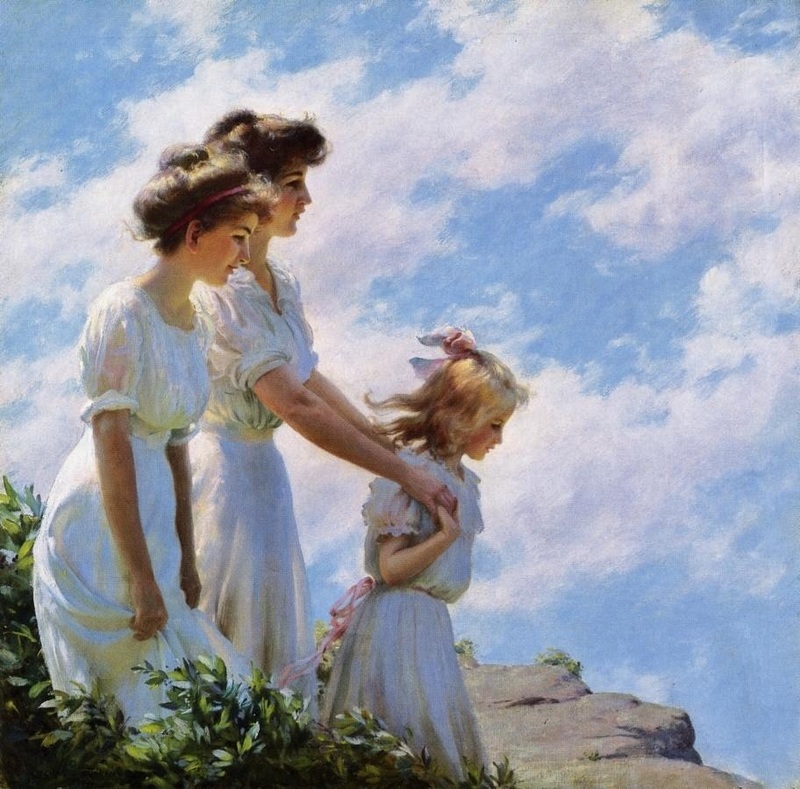 Early American Impressionist Charles Courtney Curran was memorable both for his elegant interior and exterior portraits of women and children, as well as for his leadership role at the Cragsmoor Art Colony. Often compared to fellow American Impressionists Mary Cassatt, Frank Benson, and Edmund Charles Tarbell, Curran’s iconic paintings featuring graceful young women in flowing dresses set against the vast expanse of nature captivated art critics and the public, as well as his contemporaries. Curran’s impressionistic techniques utilizing loose brushstrokes and a vivid palette combined with his nostalgic subject matter encapsulate the leisurely summer beauty of Cragsmoor. 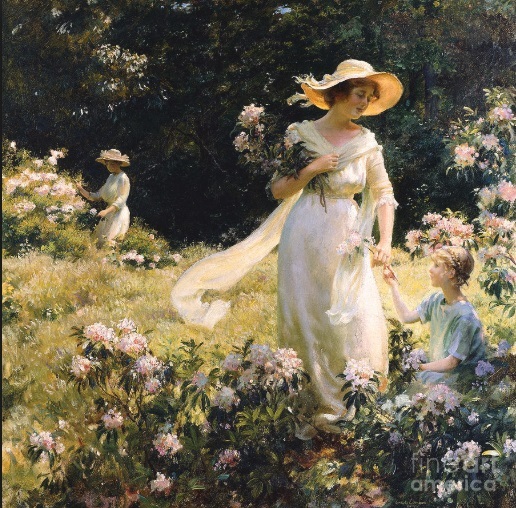 Charles Courtney Curran was born in 1861 in Hartford, Kentucky and raised in Sandusky, Ohio. He studied under Thomas B. Noble at the Cincinnati School of Design for a year before moving to New York City in 1882 where he first attended the National Academy of Design and later studied at the Art Student’s League under Walter Satterlee. At the age of 23, he made his public debut at the Academy of Design, a venue that showcased his work for the remainder of his career. In 1887, Curran’s paintings also began exhibiting at the Pennsylvania Academy where he continued to show his work for nearly three decades. He left for Paris in 1889 where he studied under Jules Lefebvre at the Académie Julian for two years. Upon his return to the United States, the artist settled in New York and began teaching at the Pratt Institute and Art Students League. 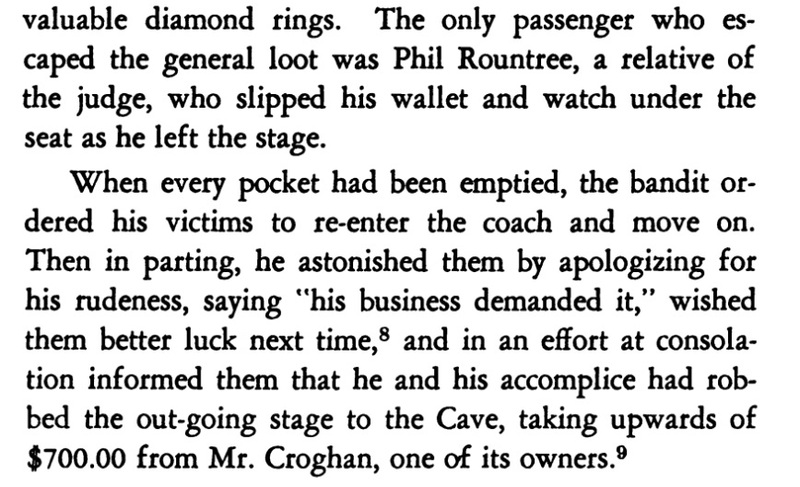 In 1903, fellow artist and friend Frederick Dellenbaugh invited Curran to visit Cragsmoor. 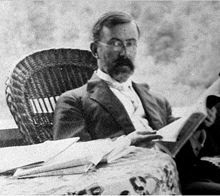 A bourgeoning summer art center started by Edward Lamson Henry, Cragsmoor was located along a plateau in the Shawangunk Mountains of the Hudson River Valley. Captivated by the landscape and creative atmosphere and Curran set up a summer home and studio. He soon established himself as a central figure of the art colony, painting, teaching, and with the help of his wife, editing the student art publication Palette and Brush during his summers in Cragsmoor. While he is best known for his sweeping landscapes featuring young women and children, Curran also painted many portraits and created a series of works featuring the Imperial Temples of Peking. 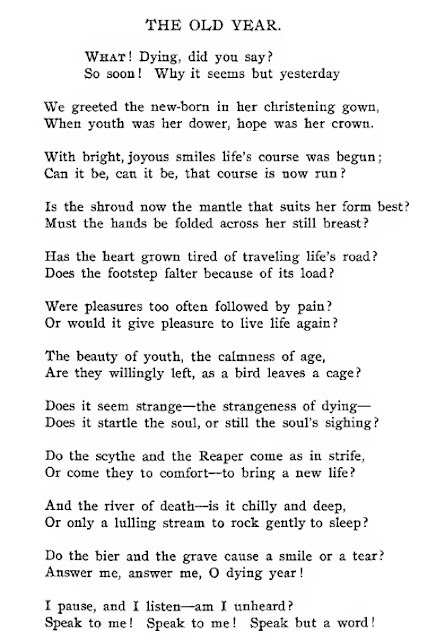 For nearly thirty years, until his death in 1942, Curran split his time between Cragsmoor and New York City. He continued to paint and maintained teaching positions at Pratt Institute, Cooper Union, and the National Academy. 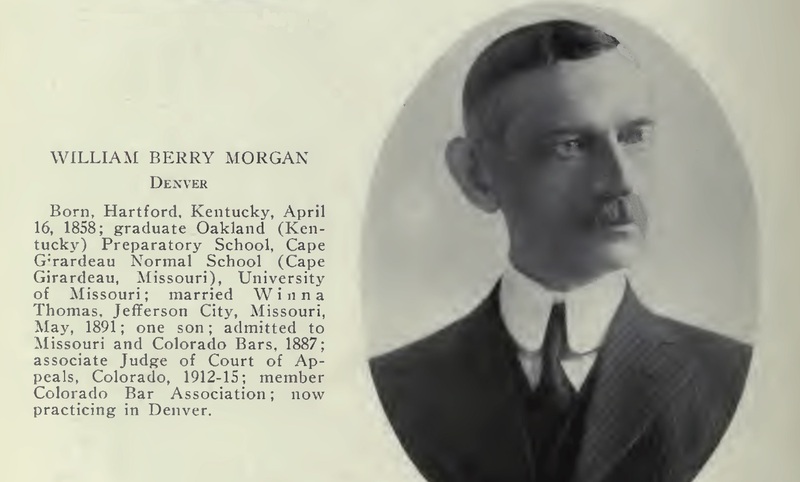 In addition to his role as a leader of the Cragsmoor Art Colony, Curran remained an active member of the American Water Color Society, Society of American Artists, and the National Arts Club. Works by the artist may be found at the Art Institute of Chicago, Brooklyn Museum of Art, Flint Institute of Arts, Metropolitan Museum of Art, Pennsylvania Academy of the Fine Arts, Richmond Art Museum, and at the Smithsonian American Art Museum. 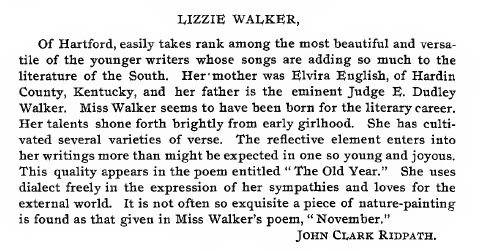 Elizabeth (Lizzie) Crutcher Walker, born Jan 1862, Hartford, and died 27 Nov 1903, Nashville, TN at age 41– buried Oakwood Cemetery, Hartford. 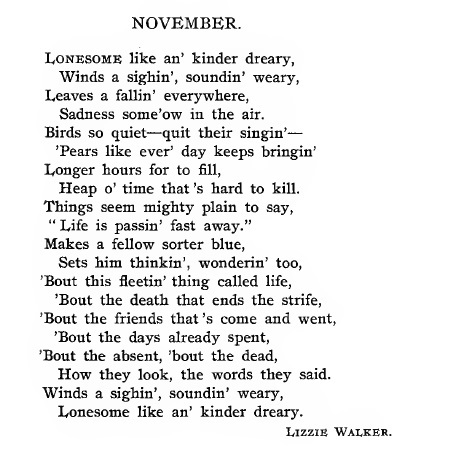 Lizzie had three poems published in 1892, which are shown below. 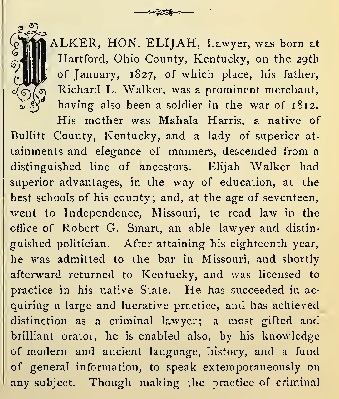 Her father was Judge Elijah Dudley Walker, born 28 Jan 1827, Hartford; and died 15 Oct 1898, Hartford. 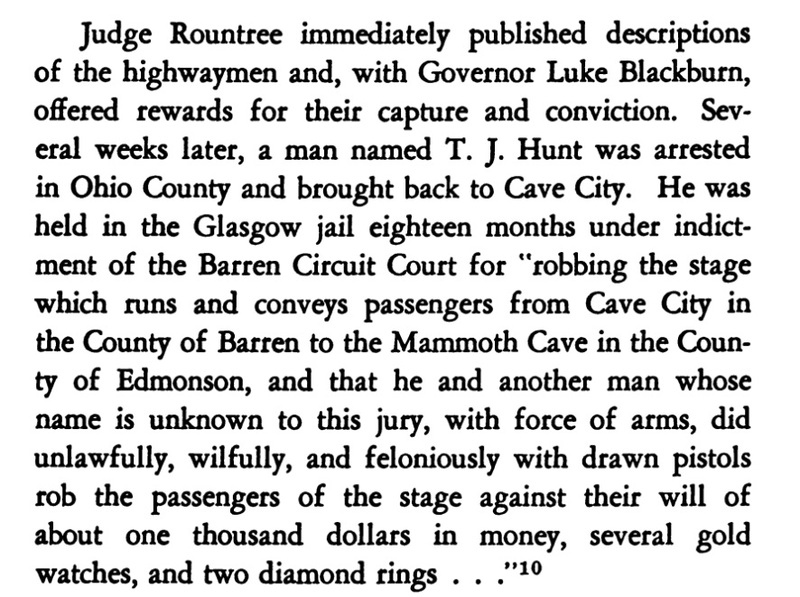 In November 1880 there was a stagecoach robbery near Cave City, Barren County, KY. A man was arrested in Ohio County and charged with this crime. 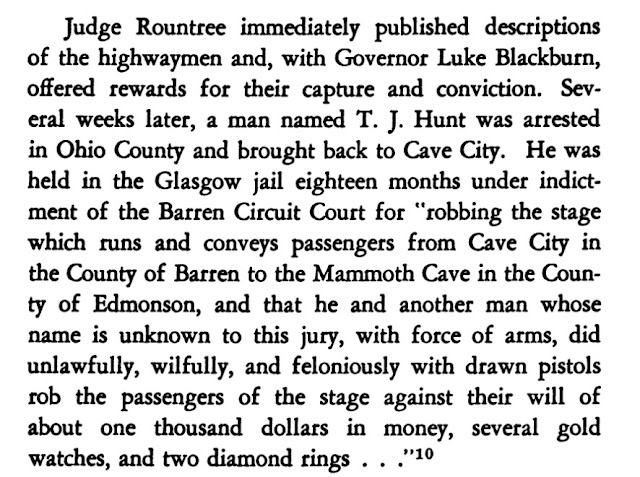 He was taken to Glasgow, the county seat for Barren County, tried and convicted. The newspaper reports said his name was T. J. 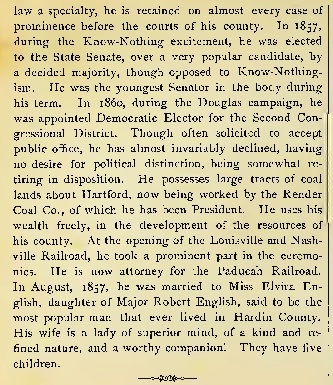 Hunt and that he had worked at the McHenry Coal Mines for about five years, that he was married and had at least one child, and was a resident of Ohio County. 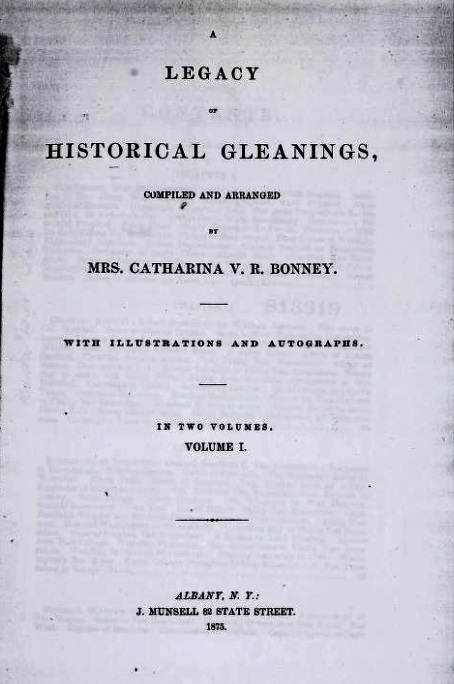 The foregoing information was taken from an article in the Hartford Herald dated 24 Nov 1880 and is attributed to the Glasgow Times. 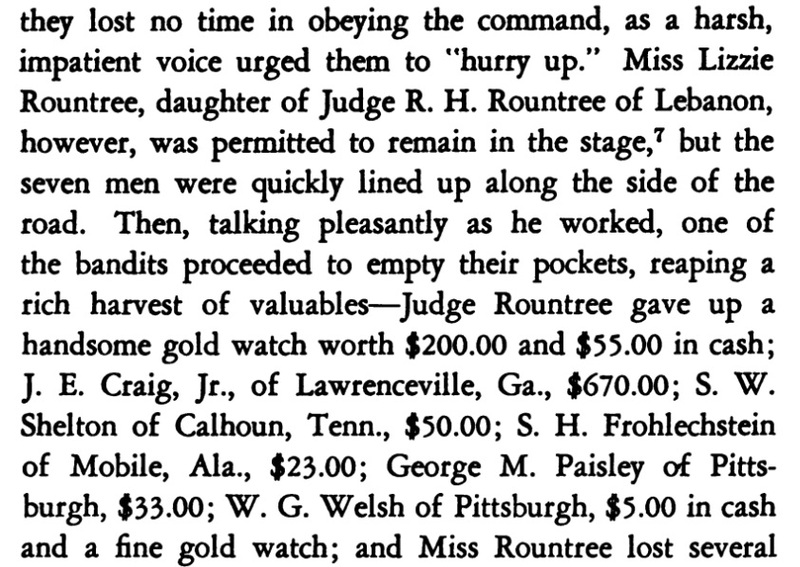 That article also said that Mr. Hunt had been previously been a teacher in Barren County ("this county"). 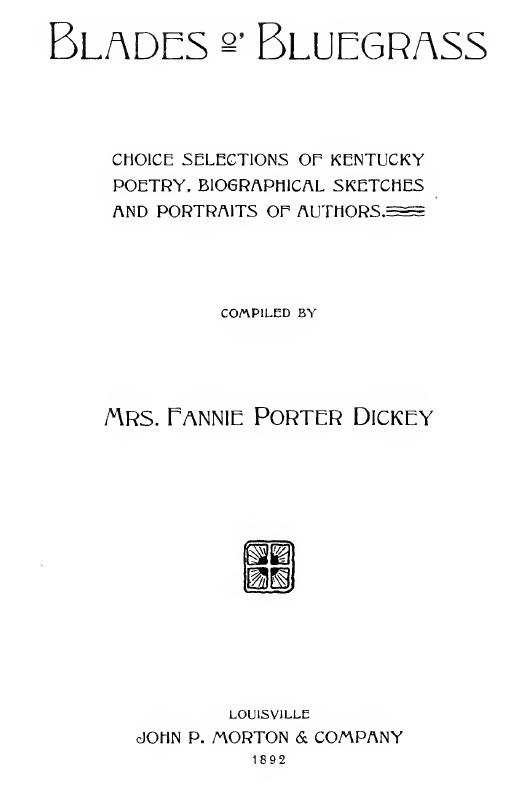 The 1880 census for Ohio County does not show anyone living in Ohio County with the surname Hunt. 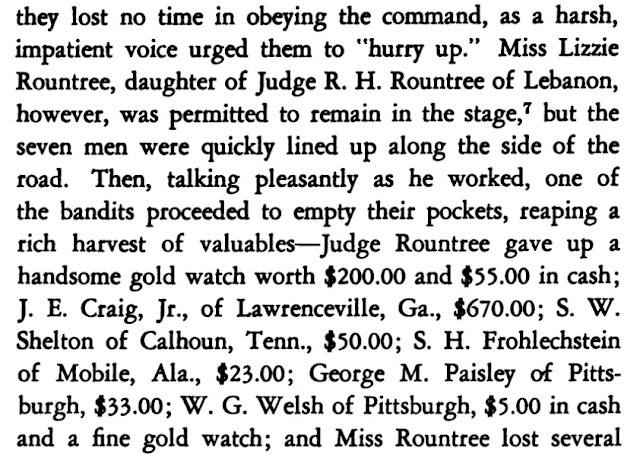 The next article, dated 1 Dec 1880, was from a Lexington newspaper that said "the Hunt brothers lived near the McHenry coal mines in Ohio County and robbed stage coaches. One has been arrested and the other brother has fled the country." 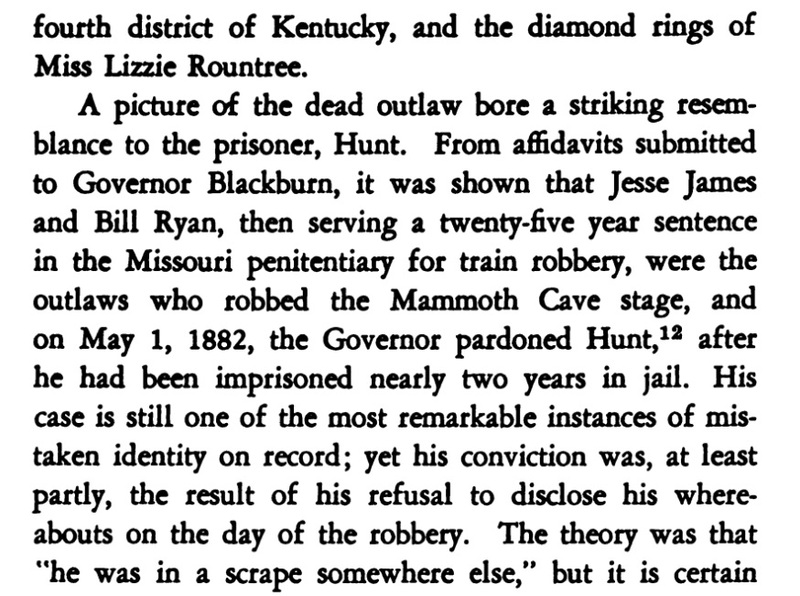 In an article dated 19 May 1882 in the Bourbon News (Paris, KY) it says "Hunt was convicted but pardoned May 1, 1882 by Governor Blackburn and released after 18 months in jail after proving he resembled Jesse James who was the actual leader of the Mammoth Cave stagecoach robbery. 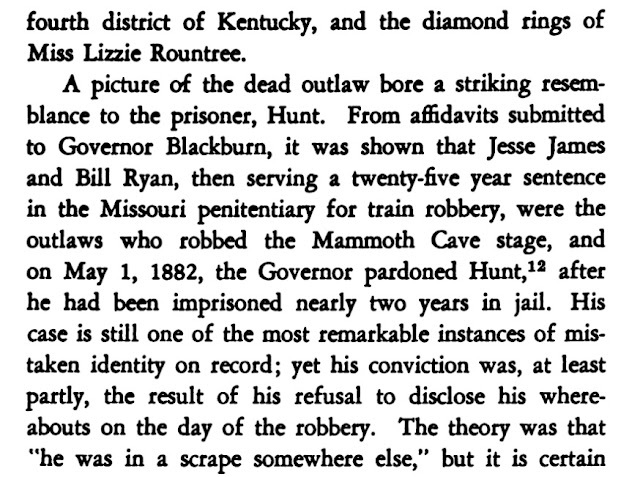 Among the effects of Jesse James when he was killed was a watch taken at the Mammoth Cave robbery. I could not find a Thomas J. 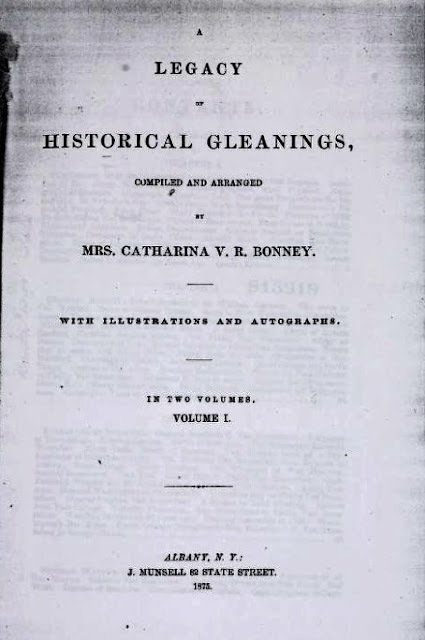 Hunt, William, Bill Hunt, or any Hunt in the Ohio County census for 1880. The 1880 census was taken between 1 June 1879 and 31 May 1880 – the robbery took place in Nov 1880. I found a Thomas J. 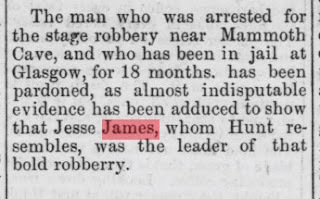 Hunt in the 1870 census in Muhlenberg County age 13 (with brother James E.) & he married in Muhlenberg County 7 Mar 1876 to Susan Day; he was born Oct 1856 and died Sep 1934 – but I have no way of knowing if the Thomas J. Hunt I found in Muhlenberg County is the person that was arrested so don't jump to any conclusions. 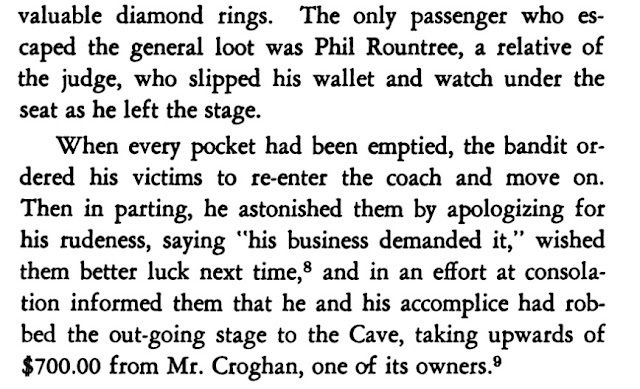 Further, I found a book about stage coaches that contained a few pages about this robbery and in the story, copied below, he is also identified as T. J. Hunt. 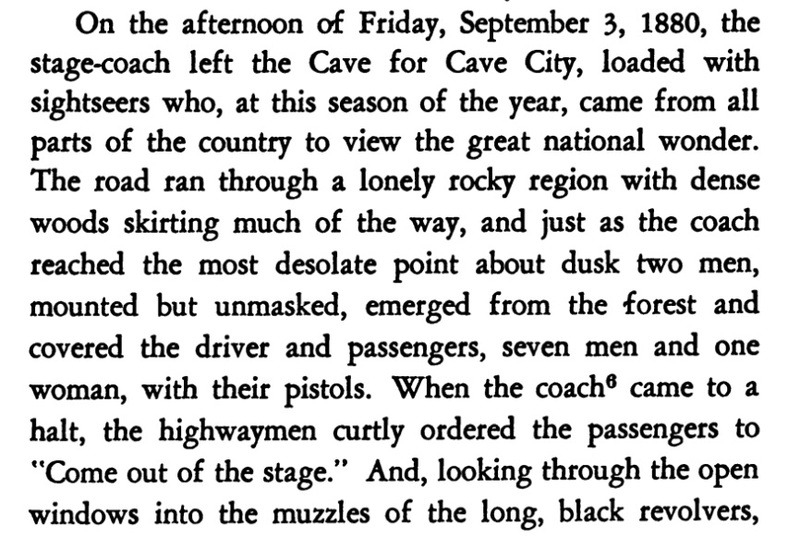 It looks like it is about 67 miles from Hartford to Cave City; in those days travel was usually by horse-back or stage coach and I don't think there was a stage coach that ran between Hartford and Cave city, so we can assume that if Mr. Hunt went to Cave City he went by horse. 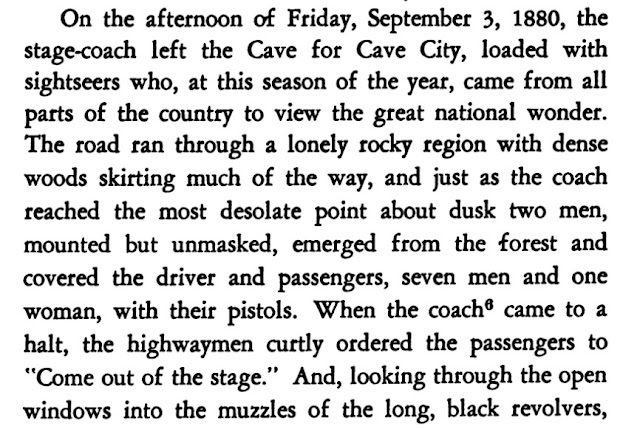 At a trot horses usually go about 10 miles per hour, so it would have taken Mr. Hunt all day to go to Cave City and another long day to return; I doubt if a horse could have done that without some rest, plus a lot of water. 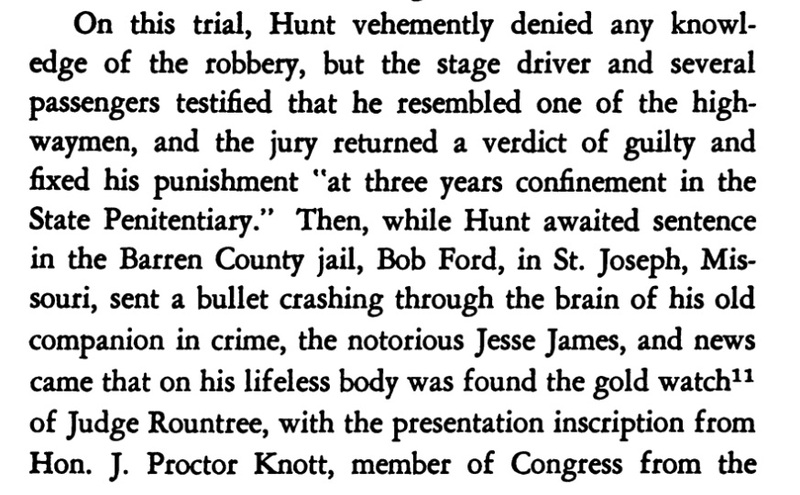 Anyway, it looks like the law and the newspapers were certain that Mr. Hunt was the guilty party (innocent till proven guilty?) 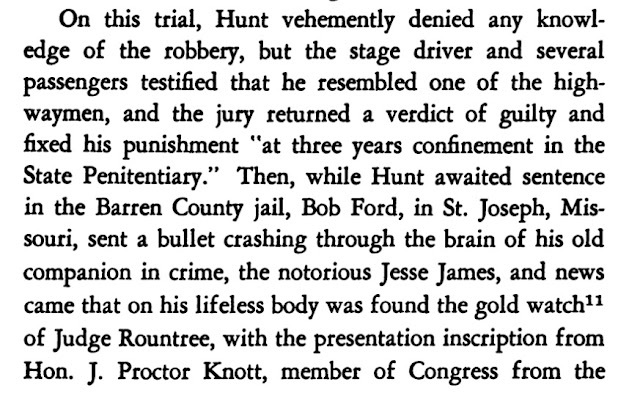 and the jury also found him guilty - but all along he was telling the truth. And it cost him 18 months in jail! 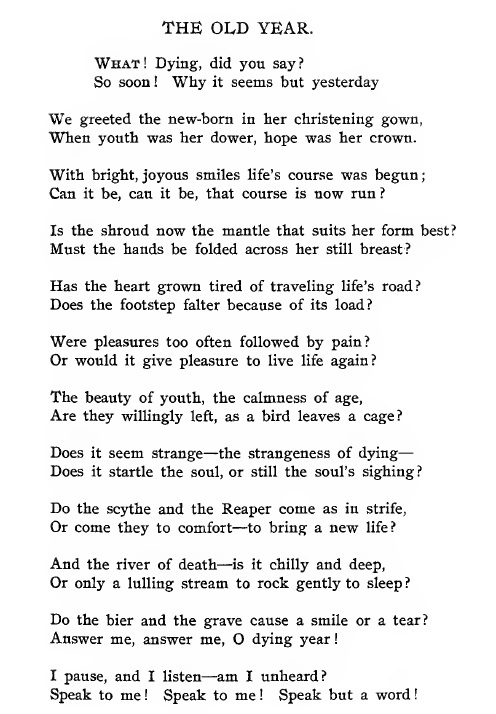 I found a letter from a doctor living in in Hartford, William M. Davis, dated 16 Jul 1839, addressed to General Stephen Van Rensselaer III, a New York landowner, businessman, militia officer, and politician. Van Renesselaer graduated from Harvard and was active in New York politics, serving three terms in the US House of Representatives as a congressman from New York. He was a Mason and served as GrandMaster of the Grand Lodge of New York from 1825 to 1829; since this letter is dated July 1829 we can speculate that the subject of the letter might have to do with ending his term as a congressman which ended March 3, 1829; there is also reference to "his son in Bogota" but the rest of the letter seems to be about General Van Rensselaer. 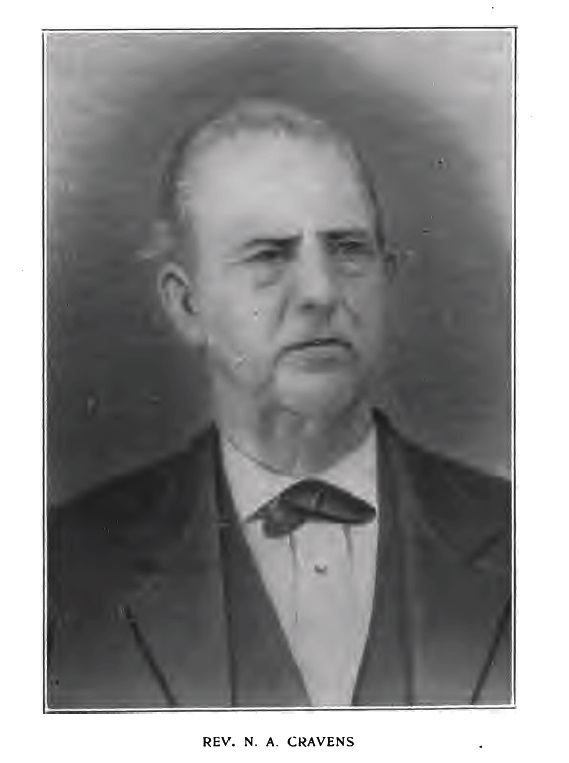 Dr. Davis is a bit of a mystery as I do not find him in the 1840 census for Ohio County. Possibly these men became friends as classmates at Hartford or in military service. 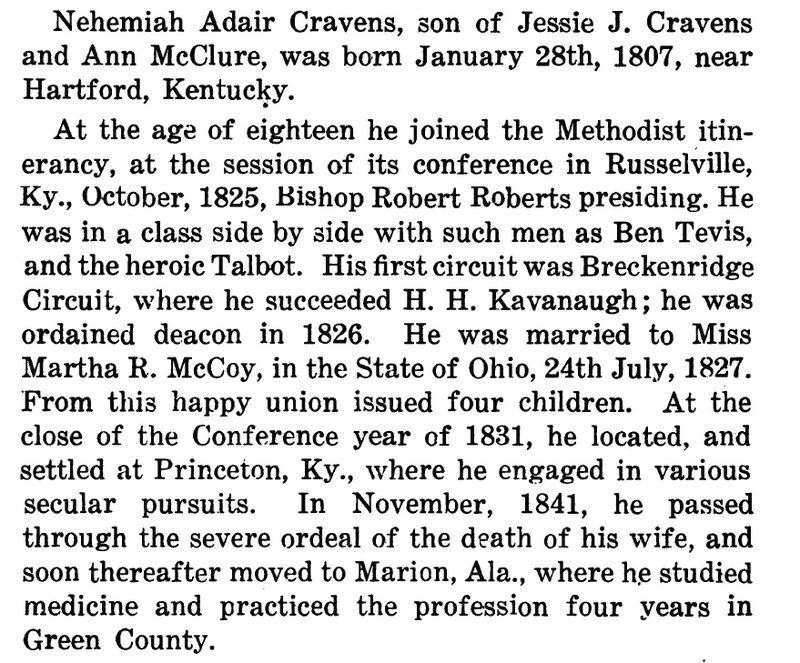 Perhaps one of you can shed some light on Dr. William M. Davis.